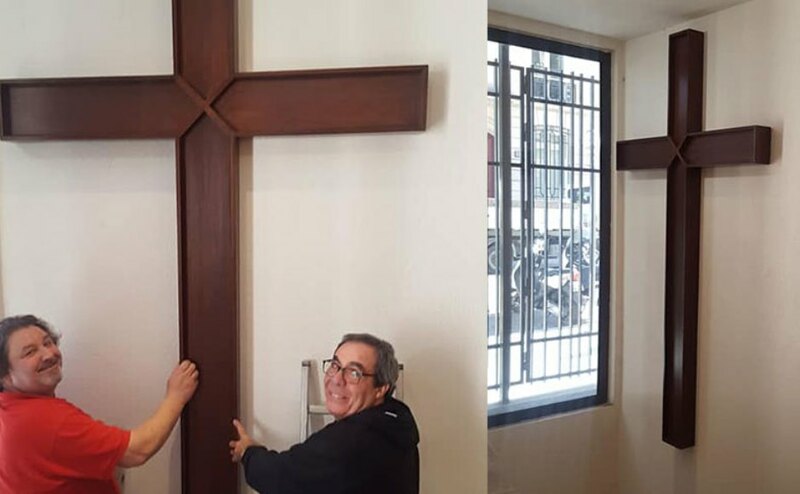 A large wooden cross gifted to a war hero minister has been rehung in his former church after languishing in a cellar for nearly 20 years. It was presented to Rev Dr Donald Caskie, who helped save more than 2,000 allied service personnel during the Second World War, by George Watson’s College in Edinburgh. Known as the Tartan Pimpernel, he played a key role in looking after the welfare of pupils taking part in an exchange programme at Lycee Henri IV in Paris in the 1950s. The school was so impressed with the kindness of the “charismatic” minister who led the Scots Kirk in the French capital that it decided to give him a gift as a token of their appreciation. He chose the 8ftx5ft Christian symbol. Pupils raised money to buy what was known as the “Watson’s Cross” in 1959 through a collection whereby each boy donated “thrupence” (three pennies). Edinburgh born Andrew Brown, who was a Watson’s pupil from 1952-63 and raised money for its purchase, felt it should be on prominent public display. He led discussions with the school, St Andrew’s Church in Brussels and the Scots Kirk - both congregations are international in flavour with members from across the world - which led to a decision to keep the cross in Paris. “For 20 years it was stacked away in the church's cellar after the existing church was built. “It tells the story of ‘paying it forward’ - giving something small which unknowingly influences the future. The annual exchange programme that George Watson’s College had with Lycée Henri IV – the alma mater of French President Emmanuel Macron – started in 1947. It was aimed at rebuilding relationships between European countries, particularly among young people, in the aftermath of the Second World War and lasted for more than 50 years. “Clearly the Watson's boys who took part in the exchange programme that we then had with Lycee Henri IV were much impressed by the charismatic minister of the Scots Kirk who helped to look after their welfare whilst they were in Paris. Mr Brown , who used to live in Paris and was baptised at the Scots Kirk, said the cross carries important memories. “The life and work of Donald Caskie, the former Kirk building, the pupil exchange programme between George Watson’s College, Edinburgh and the Lycée Henri IV as well as the long forgotten “threepenny” bit,” he added. “I am delighted with the outcome”. There he ran a Seaman's Mission, living a double life and passing the close scrutiny of the Vichy Police, and helped British and Allied soldiers to freedom across mountains into Spain. With nothing to trust but God and his instincts, the crofter's son operated in the Seaman's Mission for many months until he was betrayed by a traitor. Dr Caskie was eventually arrested by the Vichy Police, interrogated and banished from Marseille. He moved to Grenoble where he continued to arrange for the escape of soldiers, seamen and airmen under the cover of being a university chaplain. Dr Caskie was finally imprisoned by the Gestapo and sentenced to death. The minister, who was given his nickname by the BBC, had ignored repeated calls from British Intelligence and the Church of Scotland to return home. His life was only saved through the intervention of a German pastor and he spent the rest of the war in a Prisoner of War camp. The proceeds of the book penned by Edinburgh University graduate Dr Caskie, whose first charge was Gretna St Andrew's Church, helped rebuild the Scots Kirk after the war. Dr Caskie retired and after his death in 1983 at the age of 81 he was laid to rest in the family grave at Bowmore on Islay. His medals are on display at nearby Kilarrow Parish Church.